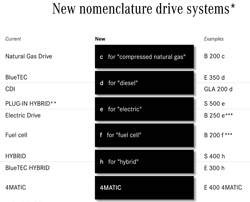 Beginning in 2015, Mercedes-Benz is revising its nomenclature strategy for many of its models. This isn't shocking news, nor is it anything new in the industry – look at the recent Q-ification of Infiniti, or the forthcoming CT/XT strategy being deployed at Cadillac. But unlike those luxury brands, Mercedes isn't shaking up the whole system, and it's actually (kind of) making things a bit easier to understand. Here's how. Things remain relatively unchanged in the rest of the lineup – sedans and four-door coupes (CLA and CLS) keep their current names. The only other notable model name change is in the roadster range, where the smaller SLK now becomes the SLC. That said, the German automaker is switching up its drivetrain designations. Things like "BlueTEC," "Electric Drive," "CDI," and even "Hybrid" are being phased out in favor of one-letter add-ons. Standard gasoline models won't get any special designation, and 4Matic will continue on as the name for the automaker's all-wheel-drive system. c – Compressed natural gas, currently "Natural Gas Drive"
d – Diesel, currently written as "BlueTEC" or "CDI"
e – Electric, which wipes out "Plug-In Hybrid," "BlueTEC Plug-In Hybrid," and "Electric Drive"
The Maybach sub-brand will debut on a more luxurious version of the S-Class at the LA Auto Show. As rumored, Mercedes will put its Maybach name to good use, this time as a sub-brand that will debut on a more luxurious version of the S-Class later this month at the Los Angeles Auto Show. That model will be officially be dubbed the Mercedes-Maybach S600. The automaker says this new vehicle "sets a new benchmark for exclusivity and meets even the most discerning of requirements in terms of its appointments." This means "extra spaciousness, special seats and lavishly designed, prestigious interiors," according to the company's press release. You can see two teasers of the ultra-lux car in the gallery, here. The name Mercedes-Maybach uses the same structure as Mercedes-AMG, which was recently given to both the new GT and C63, and will expand through the lineup as each new AMG product is introduced or refreshed. As for how the new Maybach and AMG names will be displayed on the vehicles, Mercedes-Benz spokesperson Christian Bokich says they will follow the same formula: "the placement will be 'AMG' on the driver's side, the Three-Pointed Star in the center, and the model designation on the passenger side." "Now is the ideal time to do this, for in 2015 we will be updating virtually our whole SUV model range, providing us with the perfect starting point for renaming the whole family of vehicles," Dr. Jens Theimer, head of marketing communications for Mercedes-Benz passenger cars, said in an official release. For more information on the name changes, scroll down for Benz's full press blast. The Mercedes-Maybach S-Class, which will celebrate its world premiere before the end of November, marks the opening of a new chapter in the history of the brand known by its three-pointed star. 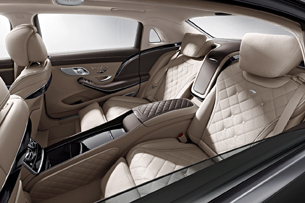 The Mercedes-Maybach S-Class expands the current range of S-Class Saloons with the addition of a vehicle that sets a new benchmark for exclusivity and meets even the most discerning of requirements in terms of its appointments. Some of the features that distinguish it from the standard-production models include extra spaciousness, special seats and lavishly designed, prestigious interiors offering extensive scope for individualisation. 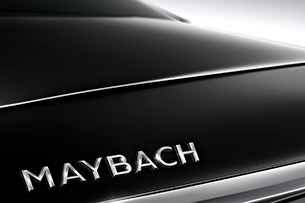 As a result, Mercedes-Maybach vehicles meet the requirements of even the most discerning customers worldwide. Mercedes- Maybach is not an equipment line – it is a sub-brand that in future will deliver Mercedes-Benz vehicles in an even more exclusive form.